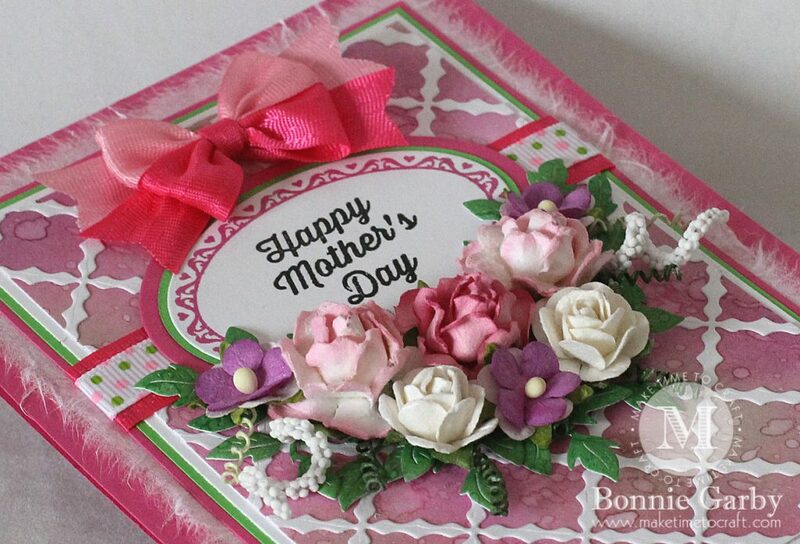 This time we have a Mother’s Day Theme and don’t forget to add ribbons or trims to your project. I created my pretty background paper with Distress Inks. I covered the background paper with the French Lattice Die from Cheery Lynn Designs. I stamped my sentiment and then cut it out with the Oval Classic Stacker die and matted with the XM7 Oval Die . I ran a layered strip of ribbon using Shocking Pink Delicate Stitched Satin Ribbon and Pink and Green Confetti Dot Grosgrain Ribbon under the sentiment panel. I embellished under the sentiment with a variety of Mulberry Flowers from Really Reasonable Ribbon. There is a wide variety of offerings and you can always find the perfect flower for any project! My bow was created on my Bow-it-All V3.0 Tool using 5/8″ Shocking Pink and Sherbet Delicate Stitched Satin Ribbon from Really Reasonable Ribbon. For a video tutorial on how to make this pretty bi-color bow, please click HERE. Beautiful Mother’s Day creation Bonnie! Love your background panel and of course the floral cluster! Always inspired by your creations! Thanks so much for playing in our ‘Flowers’ challenge at Dies R Us! Please come back again soon! What a beautiful Mothers Day card. Thanks for joining in at Make My Monday. So very gorgeous! Any mother would love to get this beauty! OH Bonnie this is gorgeous!!!! 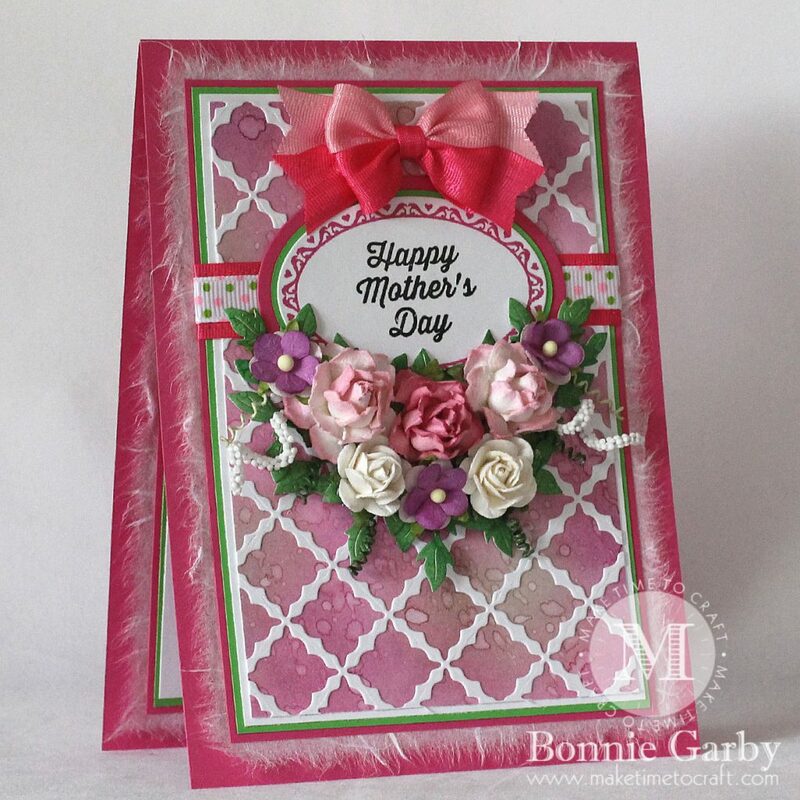 Love the background that you made and just adore that beautiful white intricate die layer! The floral arrangement is so beautiful! 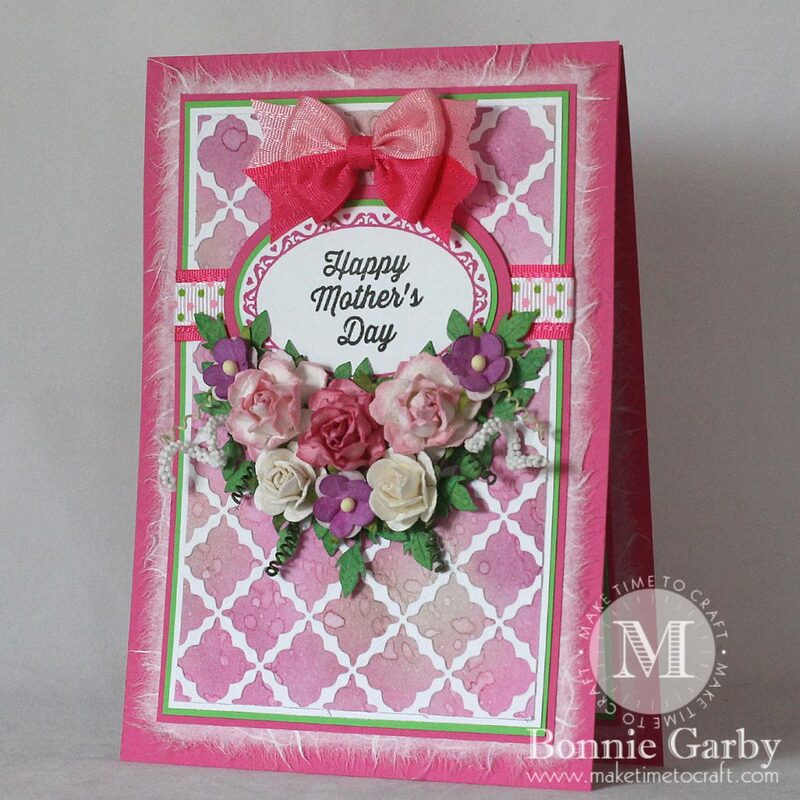 WoW… a gorgeous card for Mother’s day! Lovely design my friend! Bonnie, this is just stunning! I love the color palette, the gorgeous inky background and that lovely swag of flowers. The two tone now is the icing on the cake! Beautiful card! Thank you for joining us at Make My Monday. Sian. 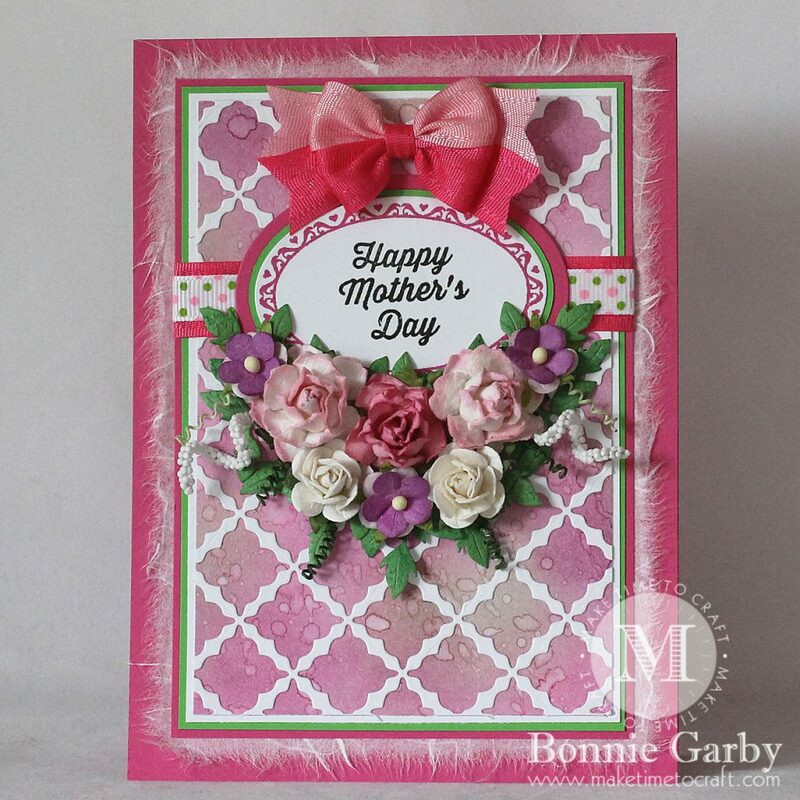 The subtle colours of this background are lovely and your card is elegant and chic. Gorgeous! Thanks so much for joining us at CCCB! Just beautiful. I love the Mulberry paper layer, don’t see it much these days! 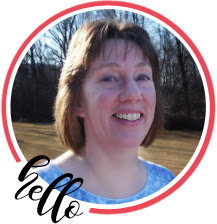 Thank-you for joining us at the Crafting with an Attitude Challenge ‘Anything Goes’ May 2017. This is fabulous! Any mother would be thrilled to receive this card! LOVE your double bow! And the flowers are the perfect compliment for the papers! Thanks for joining our “Flowers” challenge at Dies R Us!